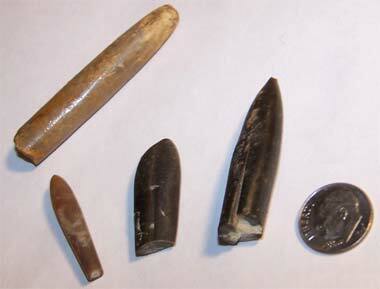 Small belemnite fossils (mostly from Europe); photo by DanielCD on Wikipedia (use permitted with attribution / share alike). Marine molluscs related to modern day squid, octopus, and pearly nautilus, belemnites were present on the Earth for a period spanning over 140 million years and disappeared about the same time of the dinosaur mass extinction approximately 65 million years ago at the end of the Cretaceous Period. Built for speed, belemnites are believed to have been efficient carnivores that caught small fish and other marine animals with ten hooked tentacles and which were consumed with their beak-like jaws.